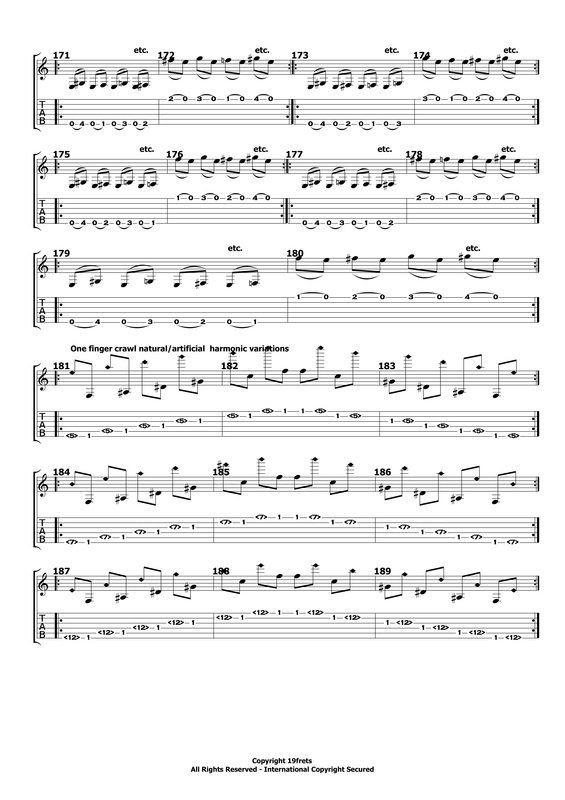 These one-finger crawl exercises are designed to improve fretted finger coordination, fret placement and finger placement for each finger on the fretted hand individually, while slowly introducing various common techniques used on guitar. Any number next to a note on the staff refers to finger number, not fret number. For the purpose of these exercises, the first finger (index finger) plays any note on the first fret. The second finger (middle finger) plays any note on the second fret. The third finger (ring finger) plays any note on the third fret. The fourth finger (little finger) plays any note on the fourth fret. Bars 1 – 3: involves a plucked open string followed by a fretted note on the same string, first fret, first finger, beginning from the sixth string ascending till you reach the first string then reversing where the same fretted finger is plucked first followed by a plucked open string descending. Bars 4 – 6: involves a plucked open string followed by a fretted note on the same string, second fret, second finger, beginning from the sixth string ascending till you reach the first string then reversing where the same fretted finger is plucked first followed by a plucked open string descending. Bars 7 – 9: involves a plucked open string followed by a fretted note on the same string, third fret, third finger, beginning from the sixth string ascending till you reach the first string then reversing where the same fretted finger is plucked first followed by a plucked open string descending. Bars 10 – 13: involves a plucked open string followed by a fretted note on the same string, fourth fret, fourth finger, beginning from the sixth string ascending till you reach the first string then reversing where the same fretted finger is plucked first followed by a plucked open string descending. 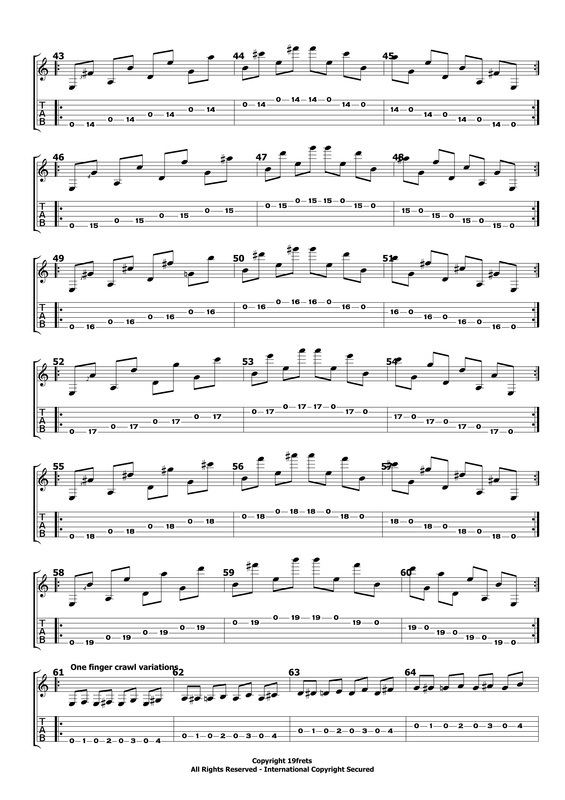 Bars 13 – 60: Involve the same principle as bars 1 – 13 but each finger will play in higher fret positions. Note, if the student wants to learn to read music they should take this as an opportunity to become familiar with notes on the staff in all different fret positions, keeping in mind what notes are the same across the fret board on the different strings. The student should notice that the same note is found on a neighboring string, four or five frets apart. Replicating the one finger crawl on higher fret positions is important, as the spacing between frets becomes more narrow, so fret and finger placement needs to be more accurate. 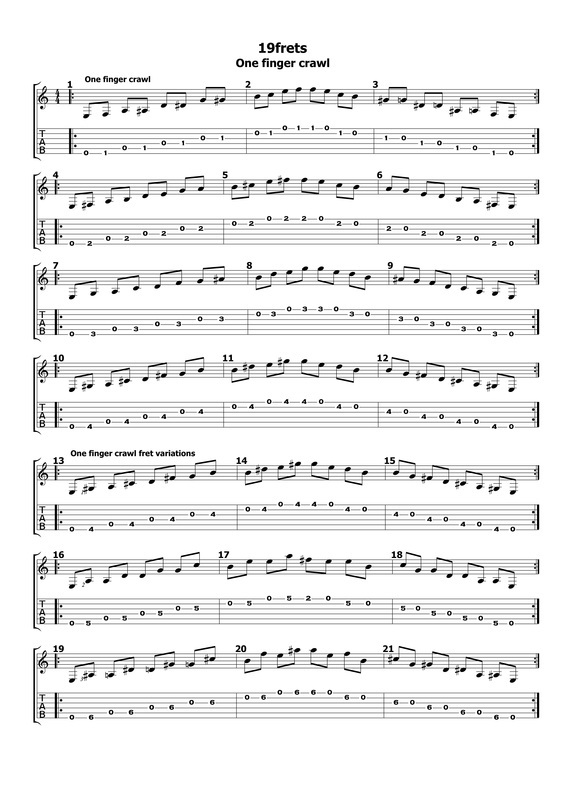 Bars 61 -72: Requires all four fretted fingers play each four frets on the same string, preceded by a plucked open string between each fretted note, ascending from the sixth string to the first, then reversing when descending from the first string back to the sixth string. 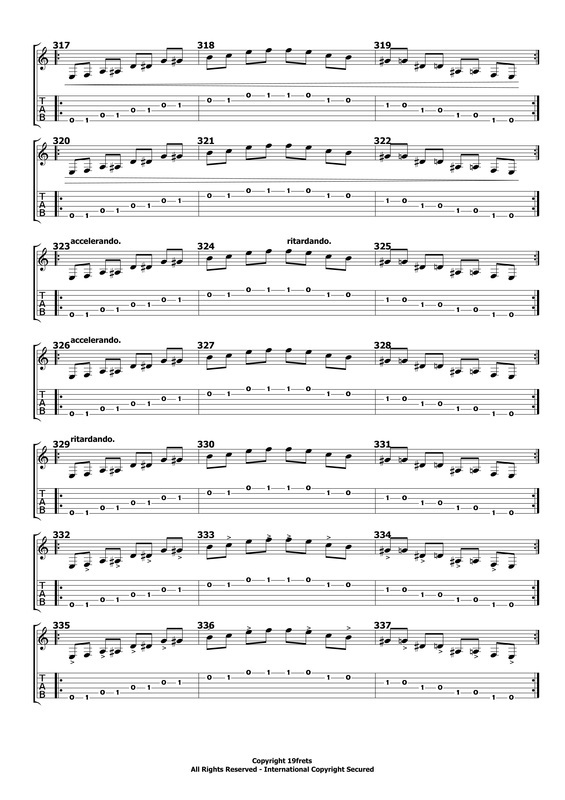 Bars 73 – 114: Indicates the different orders on how the fretted fingers are used based on how bars 61 – 72 are played both in an ascending and descending manner. 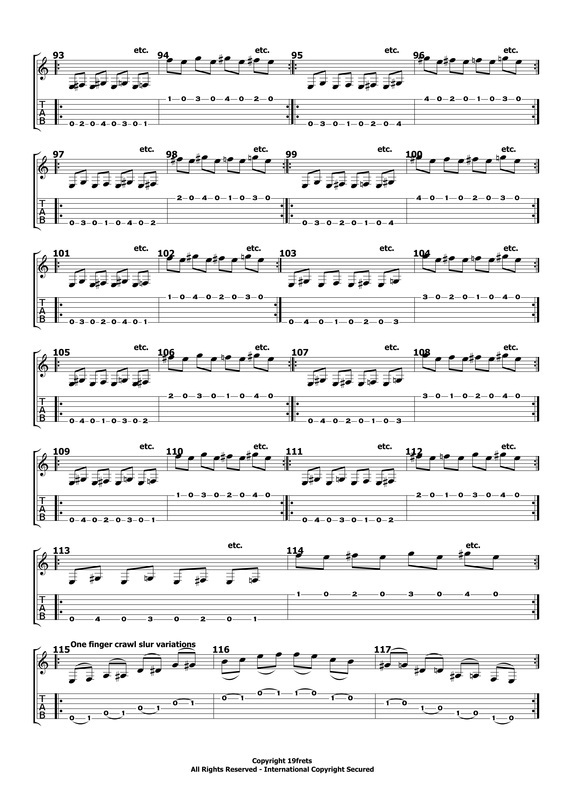 Bars 115 - 180: Exactly the same principle as everything before, except each fretted note must be played with a hammer (ascending slur) or pull off (descending slur). 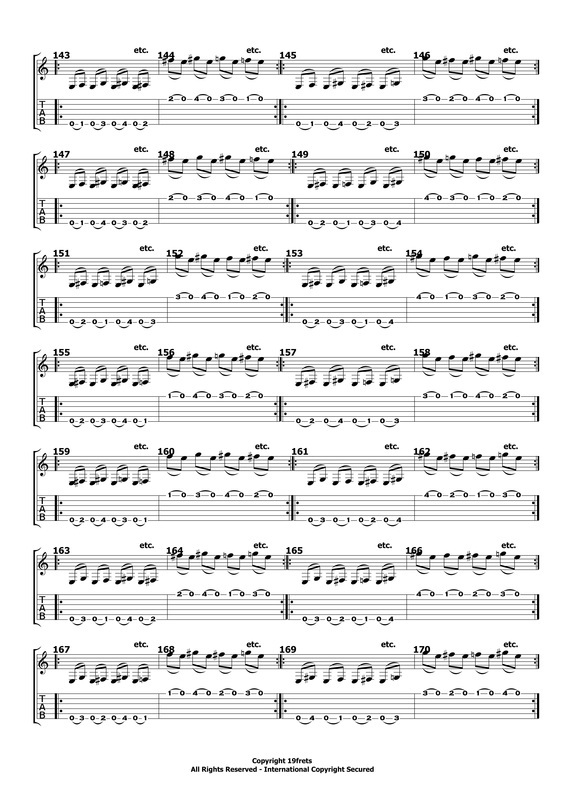 Bars 181 – 193: Again, follows the same principle as the one finger crawl except the open strings are played as natural harmonics on the fifth fret, seventh, twelfth and nineteenth frets, followed by a fretted note on the first fret, using first finger. Note, harmonics sound as a different note from when the note is fretted, so the note written on the staff is of a different pitch. 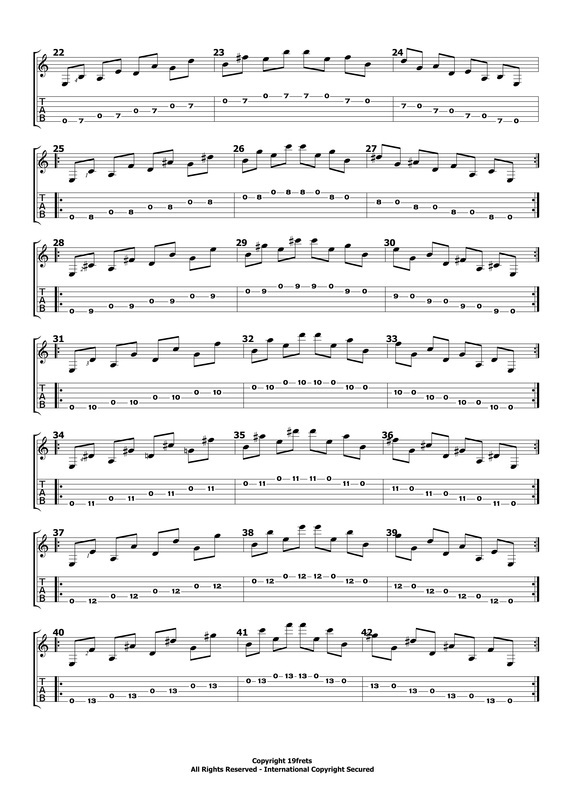 Bars 193 – 195: Involves a plucked open string followed a fretted note on the first fret played as an artificial harmonic on the thirteenth fret. Bars 196 – 198: The same principle as the previous three bars, except the open string is played as a natural harmonic on the fifth fret. 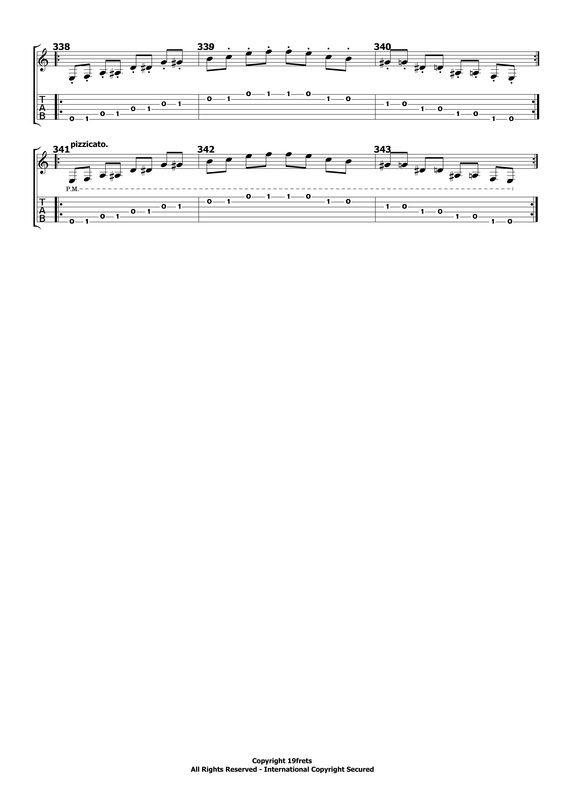 Note, the student can play bars 196- 198 replacing the natural harmonic on the fifth fret with a natural harmonic on the seventh, twelfth and nineteenth frets instead. 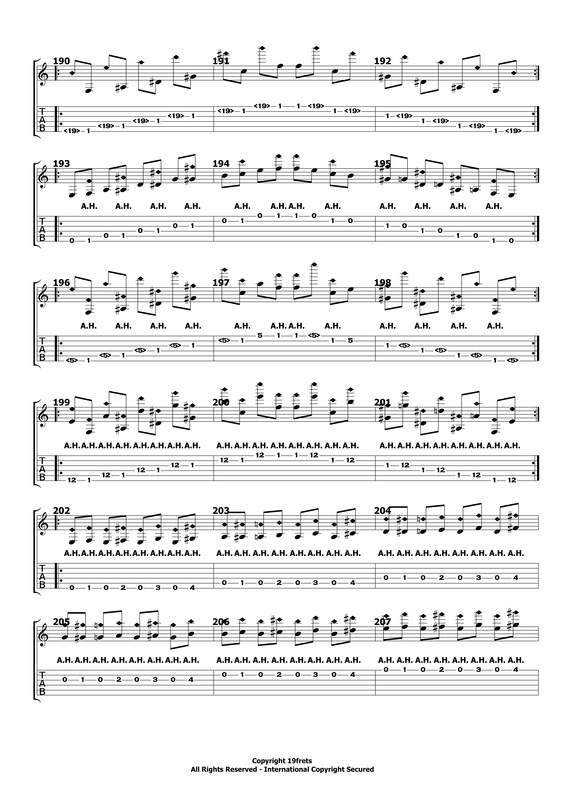 Bars 199 – 201: Requires using an artificial harmonic technique played on the twelfth fret followed by an artificial harmonic on the thirteenth fret. 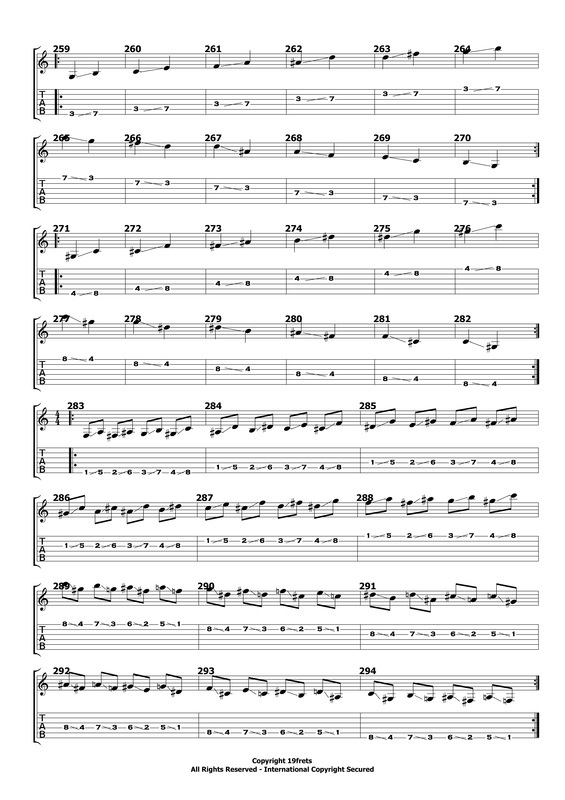 Bars 202 – 213: Is the one finger crawl again like bars 61 – 72, except all notes are played as artificial harmonics. Note, The student should also play the one finger crawl in different orders as artificial harmonics (refer to bars 73 -112 for variations). Bars 214 -228: Is the one finger crawl using the first finger on the first fret. Except the first finger is required to depress more than one string creating a “barre” starting by first covering two neighboring strings, till eventually all six strings need to be covered. Note, The notes and barre highlighted by a dotted line above the staff, indicates that the barre can remain held over the plucked open strings. Bars 229 – 234: The same principle as the barre exercises before, except the fourth finger is used to cover more than one string. 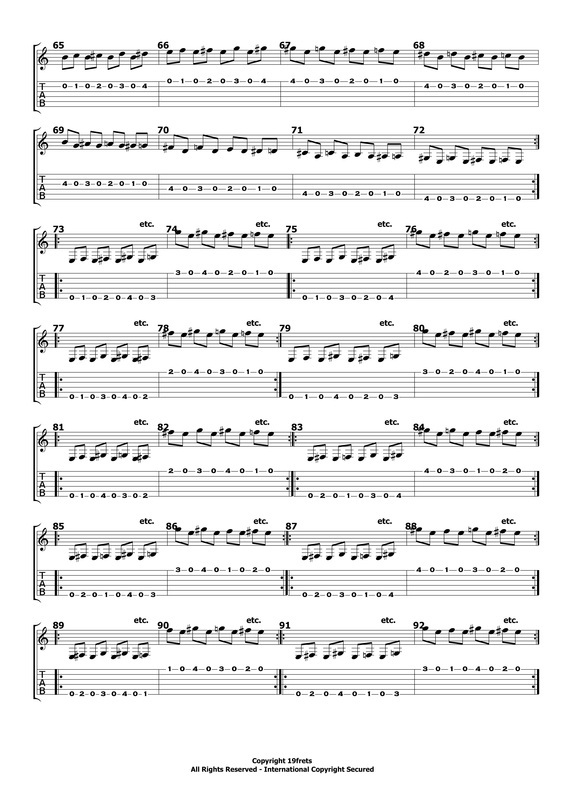 Bars 235 – 282: Refers back to the one finger crawl, except every fretted note slides to a fretted note on the same string with a five-fret gap. Note, The student should not forget to abide by the guidelines of playing first fret with first finger, second fret with second finger, third fret with third finger and fourth fret with fourth finger. 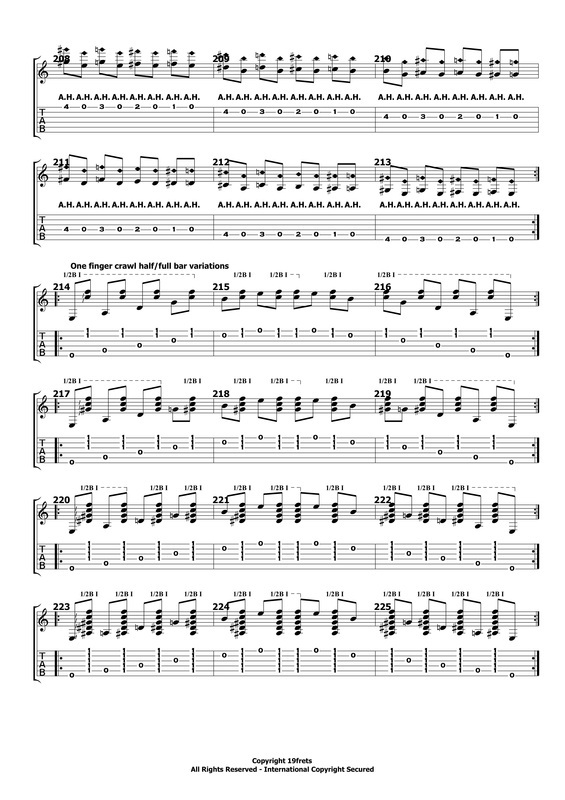 Bars 283 – 294: The one finger crawl using four of the different fretted fingers to slide with a five fret gap on each string. 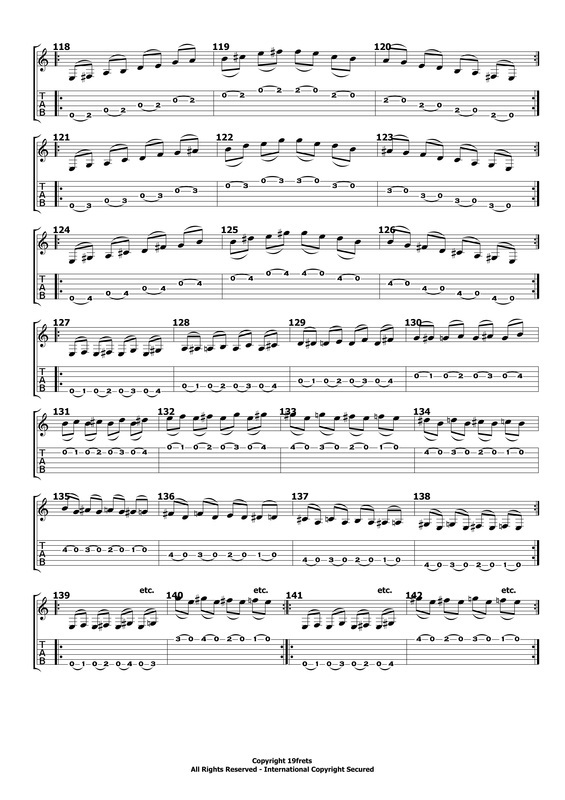 Note, refer back to one finger crawl variations to practice slides with different fretted and finger orders. Note, the student can also replace the five-fret gap with seven fret, ten fret or twelve fret gaps. 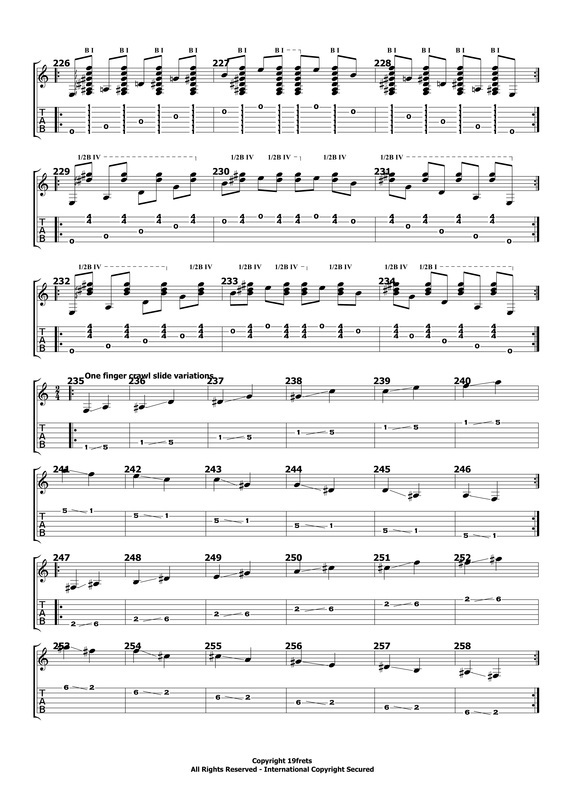 Bars 295 – 307: These are different examples of plucking variations when playing all the exercises. The letters below the notes indicate the different plucking variations that can be used. Bars 308 -310: The student should practice all exercises using apoyando (rest stroke) when possible. Bars 311 – 322: Indicates how the one finger crawl can also be played using dynamic control by practising with crescendo (getting louder) and decrescendo (getting softer). Bars 323 – 331: Indicates how the one finger crawl can be played using accelerando (getting faster) and ritardando (getting slower). Bars 332 337: Indicates how the one finger crawl can be played using displaced accents. 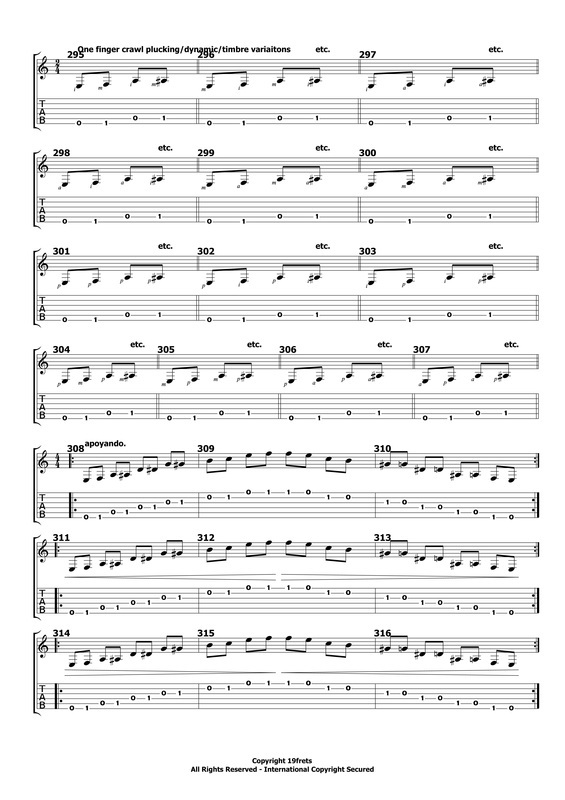 Bars 338 -330: Indicates how the one finger crawl can be played using staccato (detached) notes. Bars 341 – 343: The student should try playing the one finger crawl by using pizzicato when possible.